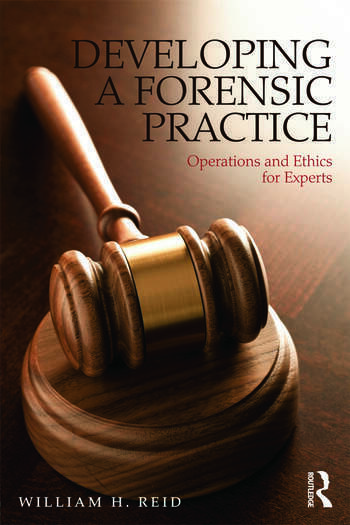 Developing a forensic practice can be confusing and intimidating. Dr. William Reid, a highly experienced forensic psychiatrist, has written a practical, straightforward guide for clinicians interested in doing it right and increasing their opportunities for a successful transition to forensic work. This book, which will be of interest to many attorneys as well, provides straightforward details, along with many case examples, of lawyer-expert communications and relationships, case assessment, record review, evaluations, reports, deposition and trial testimony, fees and billing, office operations, marketing, liability, and professional ethics. A bonus chapter by a successful malpractice attorney gives a unique and valuable "lawyer’s perspective" on the content and mental health experts in general. The huge appendix provides over 40 highly useful examples of common office forms, letters, reports, and affidavits. Any mental health professional who currently practices, or wants to practice, at the interface of mental health and the law will find this an indispensible practice resource. Getting Started. Vocabulary. Lawyer-Expert Relationships. Records and Record Review. Evaluations. Reports and Affidavits. Deposition and Trial Testimony. Fees and Billing. Ethics. Marketing. Your Office and Office Procedures. Liability in Forensic Practice. Simpson, A Lawyer's Perspective on Forensic Mental Health Experts. Appendices. William H. Reid, MD, MPH, past president of the American Academy of Psychiatry and the Law, has practiced forensic psychiatry for over 35 years in private settings, medical schools, and the public sector.